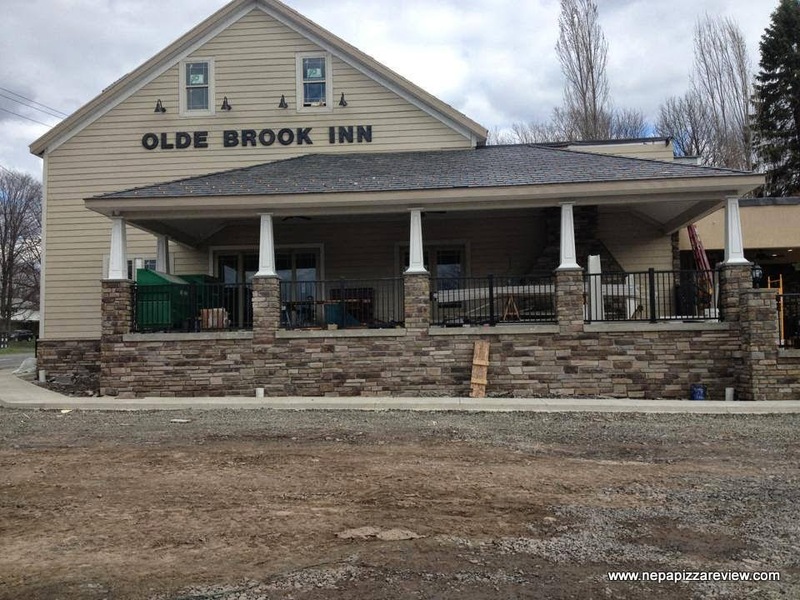 The Olde Brook Inn - Revived and Slinging Great Wood-Fired Pizza! The Olde Brook Inn is a brand new place that I came across at a party with some friends. I heard word of an old tavern which was completely gutted, renovated, and given a new life in the Moscow area. 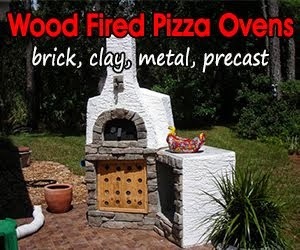 I was told about the latest place to offer gourmet pizza cooked in a wood fired oven and that's all I needed to hear to venture down with a group of friends. Now I've been to hundreds and hundreds of restaurants around NEPA, and many of them would be characterized as very nice, immaculate, clean, brand new, etc, but when we pulled up to the Olde Brook, I have to say I was completely blown away by my surroundings. First of all, the place is gigantic, and every last detail from the porch to the patio, to the dining rooms, to the several bars, to the bathrooms, all the way down to the Rathskellar in the basement looks brand new and in pristine condition. Our group attended on a busy Saturday night about a week after the place opened, so the restaurant was absolutely mobbed with happy diners and people socializing everywhere. I don't know what the history of the building is, but it was amazing to see such an old place be brought back to life and thriving once again. While waiting for our table, we took an informal tour through the place and scoped out each room, each one more inviting than the next. I thought to myself that every seat in the place created its own unique and warm experience whether I felt like chilling on the deck next to the open flame fireplace and heaters, downstairs in the cigar bar, or in the formal yet casual dining rooms. After surveying the territory, the consensus within the group was that this place was very impressive and a lively place where we were thrilled to be. When we were seated and given menus, I scanned the menu to find numerous inviting dishes, but what struck me was the exceptional value prices provided on the higher end dishes. We decided to order a little of everything, but I stuck to a margherita pizza for an appetizer and a seafood fra diavolo as my entree. 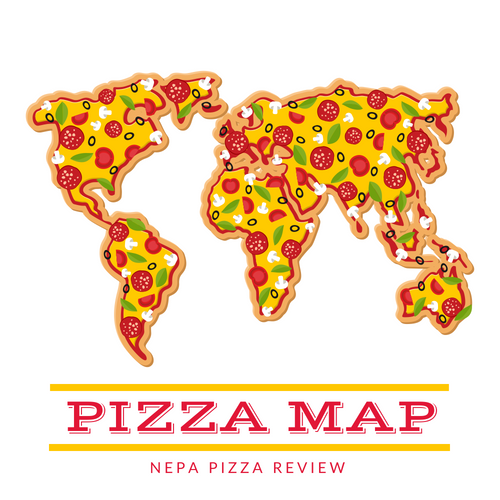 Several people in my group mentioned that we had a pizza critic in the house and perked up the ears of some diners at the bar who raved about the shrimp scampi pizza. Since it came so highly recommended, a pizza was ordered for the table, which meant that I was going to try not one pizza, but two on this occasion. When the pizzas came out, they were approximately 12" round and looked fantastic. I'll get right down to it in saying the crust was incredible, with a perfect amount of golden brown and charring around the edges and just enough of the smoky wood flavor without being too overpowering. 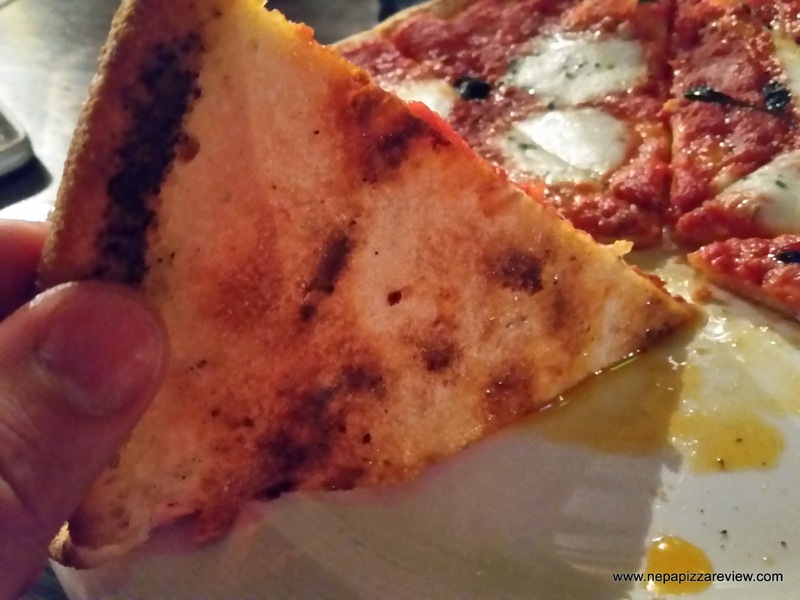 The dough was light and airy, yet provided a satisfying crispy crunch that I raved about. 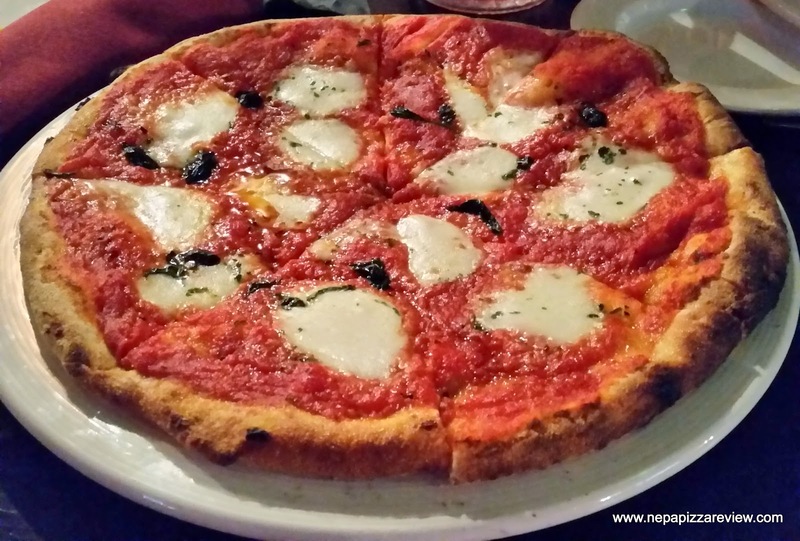 The sauce on the margherita was quite tasty and had a smooth consistency. My personal preference is to have a little bit of tomato chunkiness on this style of pizza, but that's just me, and I think most people prefer it as presented! The fresh mozzarella and herbs topped the whole pie off beautifully and I have to say the flavor combination was refreshing and well balanced. Next up, it was time to try the shrimp scampi pizza, and let me just say that it was every bit as good as advertised. Many times when you order shrimp on a pizza, you get the tiny salad shrimp that don't even have the flavor or texture of real shrimp, but that was not the case here. The Olde Brook uses larger shrimp and slices it up to provide a high-end flavor and texture. 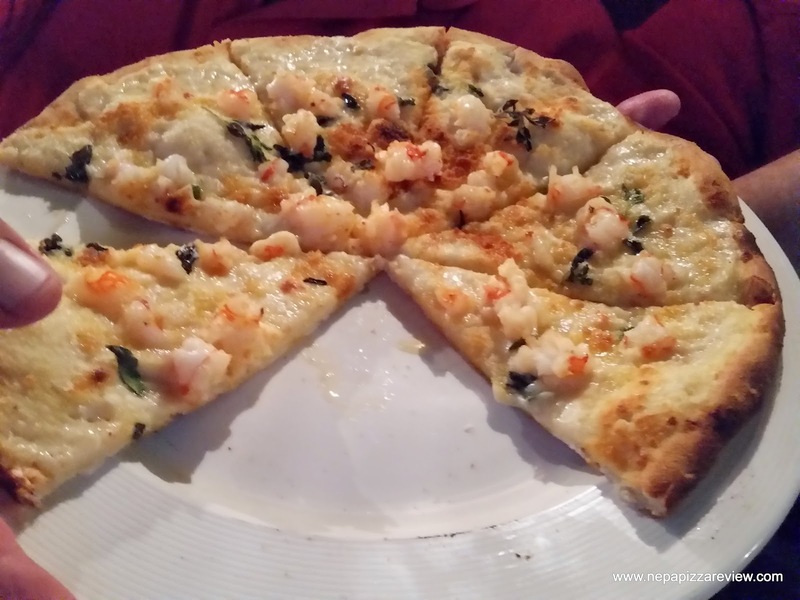 The pizza featured the same great crust as the margherita, but the flavors of the garlic, lemon, shrimp, parmesan cheese and herbs was something that I can't even describe to you so you are going to have to get to the Olde Brook and try it for yourself! After experiencing this establishment for the first time, I have to say I was very impressed and the it earned rave reviews from everyone that I spoke to. I look forward to taking the first lady on a nice relaxing date there one evening, or hanging out at the bar with friends. Whether you live in the immediate area or an hour away, this place is worth the trip. I consider this a destination dinner that is worth the drive, so get out there and let me know what you think!